Madefire uses Comic-Con to debut new features, services, and a long-awaited Android app. A couple of years ago, one of the big surprise hits at Comic-Con was the debut of Madefire. The company used the show to debut its "motion book" app for iOS devices. Not content to simply scan in existing material and toss it into the ether for fans to read, Madefire created a new format which allowed creators to craft stories that went well beyond the printed page. Since then, Madefire has grown considerably, forming digital partnerships with publishers like IDW (Star Trek, Transformers), Valiant (Unity, Rai), Top Cow (The Darkness), and DC Comics (Injustice: Gods Among Us, Infinite Crisis), as well as individual creators like Dave Gibbons (Watchmen, The Originals) and Liam Sharp (Spawn: The Dark Ages,Red Sonja). One thing Madefire hasn't done, though, is give comic fans with Android devices a way to check out that growing library. At least, not until now. Earlier today, the company announced a new push for its digital publishing platform, the first step of which being the debut of the Madefire Motion Books & Comics app (available starting today via Google Play). With the new app, Android users can take full advantage of all the features the Madefire format offers, including panoramic art, animation, motion controls, and sound effects. Madefire is also expanding its market with the introduction of a new "Print Books" category for all platforms. Print Books will feature a more traditional reading experience by offering simple pageviews with pinch and zoom navigation. By adding the "Print Books" option, Madefire is setting its sights square on other digital comic apps, such as the ComiXology Comics app and the Marvel Unlimited app. 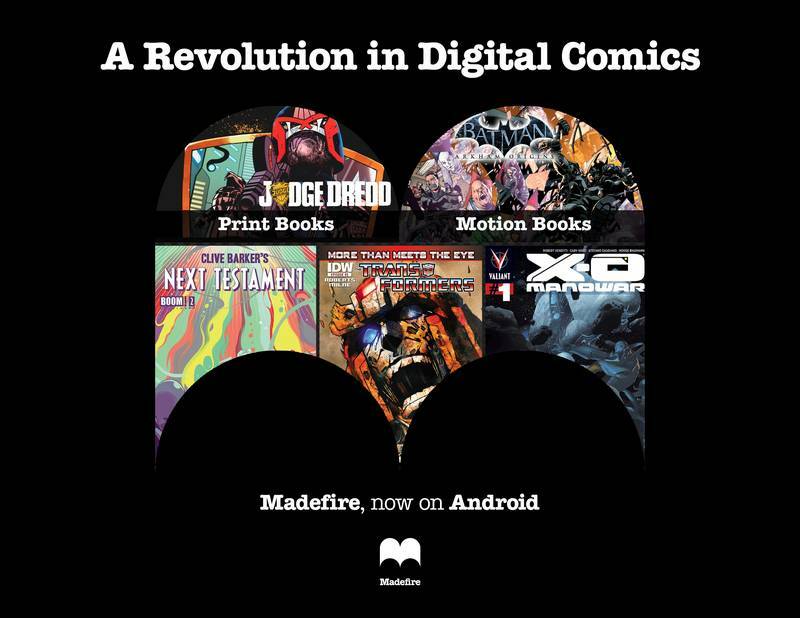 Madefire's Android debut and Print Books option are just the latest announcements from the company. Last week, it rolled out its powerful web-based Motion Book Tool, allowing users worldwide to create and publish their own works with the Madefire technology. "Since we opened our Motion Book Tool we've been staggered at the appetite for digital comics," said Ben Wolstenholme, CEO of Madefire. "From Print comics to Motion Books, and from new creators to established studios like DC, it's all on Madefire. It's taken years, but we've now rolled out the most advanced comic book platform in the world and made it open to all."